For many home cooks, making pie and pastry can be intimidating. 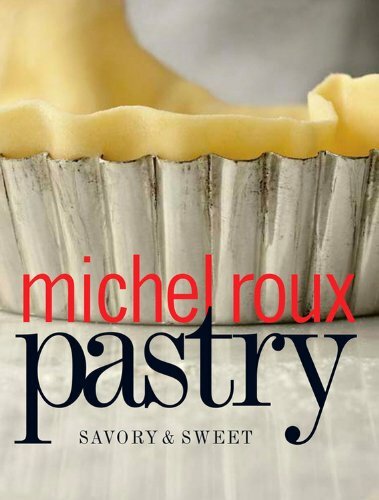 Now, in his exciting new cookbook, Michelin three-star chef Michel Roux shows how easy it is to prepare pastry at home just like a professional. All types of dough are covered--short crust, brioche, puff pastry, croissant, and more. Roux provides detailed, step-by-step techniques, all illustrated with stunning color photographs. He also presents a range of classic and contemporary recipes—100 in all — with mouthwatering photographs of almost every one. Showstopping sweets include Sweet Pumpkin Tart with Toasted Almonds, Chocolate and Raspberry Tart, and Apple Turnovers. For something savory, there are Onion and Bacon Mini Pizzas, Phyllo Croustades with Seared Tuna, and Herbed Monkfish in a Puff Pastry Crust. For home cooks who want a new bible on the subject of making pie and pastry at home, this book is the answer. The name is a culinary legend. Michel with his older brother Albert arrived in England in 1971 to open the original Le Gavroche Restaurant in Lower Sloane Street. The address was imprinted immediately onto the gourmets and gourmands across the country. By 1972 when they opened The Waterside Inn, they had another 3 restaurants in London, each a landmark in a city not then known for fine dining. Between them they have trained over 800 young chefs many of whom are now also legendary. Since 1984 the Roux Scholarship is undoubtedly considered the ultimate British competition for chefs. The Roux Scholar 2010 is Kenneth Culhane. They were the first to sponsor young chefs into their own business, among them being Pierre Koffman at La Tante Claire and Christian Germain at Chateau de Montreuil in France. They were unique benefactors, as they not only organised the backers, personally guaranteed the chef’s bank loan, but wrote in the contract that no shareholder could refuse to sell their shares back to the Chef Patron!